Of the designs I have made, I believe the TMM is the one that best defines my conception of design. It is a very simple lamp, and this is proven by the fact that one can dismantle it in an instant. Its advantage is that removing the lampshade is very easy, even when the lamp is switched on. 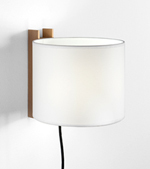 Then you have the leg, the electric components and the conventional shade, which in fact can be changed, when it breaks as it gets old or whatever, and there you have a new lamp. For that reason, that might be the object that best defines my conception of design. At the biginning, what I was most grateful for was that people kept buying a lamp with many faults. I thought the rubber supporting the lampshade would last forever, but the light attacked it! Just imagine what that means for a lamp! In addition, the wooden shaft would twist and end up out of joint, a series of faults then, not that many really, but despite everything people continued buying it. That was just marvellous! When we made this lamp I had a small business that allowed me to make the things I conceived. 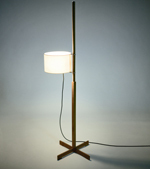 One day my partner asked me to make another floor lamp because just with one wasn´t enough. I fell into pieces. I told him: "but I already made it, don´t ask me for another one! Maybe another one will come, but don´t ask me for it right now, don´t force me!" and this always happens to me with everything. When you have thrown yourself into creating a floor lamp, it´s very difficult to make another one just because you have to. I very much liked a sentence from El Gallito, the bullfighter. When he was asked: "Maestro, what is a classic? ", he replied: "A classic is what cannot be done better."